basil – a pinch – chop it onto a salad or onto a sandwich or crostini perhaps? snow peas – great for stir fries or raw in salads. You can eat pod and all like the snap peas, only they don’t get big and round like the snap peas do. rainbow chard – the stems take longer to cook than the leaves so many people will cook the stems first for a bit before adding the leaves. Good sauteed, braised, steamed, etc. 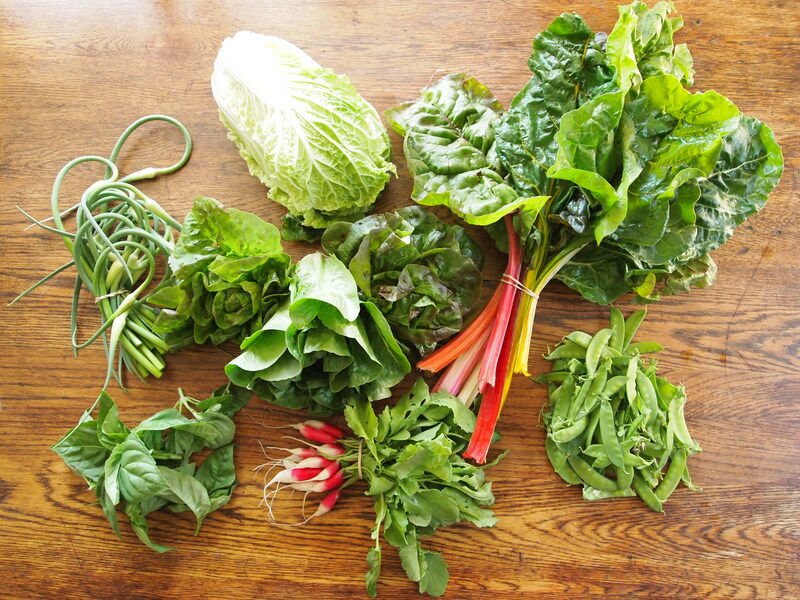 Chard is related to spinach and can be used in place of it in dishes where it is cooked – however omit the stems as they are much tougher than spinach stems. napa cabbage (aka chinese cabbage) – rinse this guy really well after you chop it up as all the nooks and crannies tend to accumulate gunk in the field. It’s uses include slaw, salad, or wilt it as a base for seared tuna. Here’s a napa cabbage slaw with peanut sauce recipe. lettuce – 2 heads of the mini “Australe,” a red/green butterhead/romaine, and 1 head of “winter density,” a green romaine. Enjoy the lettuce these next few weeks – there may be a shortage of it about 3 weeks out as my germination has been bad on a lot of my lettuce seedings for transplant. I finally got to stringing up the second row of tomatoes in the hoophouse this afternoon. They are large, and so not very willing to change their position or shape to suit the trellis, but I persuaded them anyway. I need to add more strings to the cucumber trellis to catch all of the vines that each plant is sending out. I also need to build a pole bean trellis ASAP as the romano beans are growing lightning fast. There is always, always so much to do.